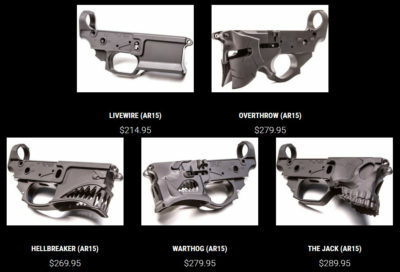 Related Tags: Accessories, AR-15, Buzz, Industry News, Sharp Bros.
Sharps Bros., the company that makes the eye-catching Hellbreaker, Jack, Overthrow and Warthog AR-15 lower receivers, has new products and new pricing. Along with the price drop, Sharps is announcing a new series of handguards for AR-pattern guns. On top of that they are adding 80 percent receivers for home gunsmiths as well as builder kits. The price reductions are solid and might be just the thing for builders who have passed on their products in the past. The price drops are in effect immediately with new products to arrive in January 2019. Prices now start at just $214 and top out at $289. Sharps isn’t cutting corners to make these receivers cost less. They’re still machined from 7075-T6 alloy aluminum with ambidextrous markings and all the other features that made them stand out in the first place. Other features common to all of Sharps’ lower receivers include integral oversized trigger guards, enlarged, flared magwells and lightning cuts in the rear of the magwell. They are completely compatible with MIL-SPEC components and popular aftermarket magazines including Magpul Pmags. The handguards are priced competitively, too, starting at $130 for the 7-inch model and just $144 for the most expensive 15-inch version. The handguards are free-floating modular rails with M-Lok slots. They sport a minimalist design with only a short section of 12-o’clock rail at the front for an iron sight and a small section at the rear for accessories that extend beyond a flattop rail. They use a proprietary barrel nut that doesn’t require indexing. It’s also long to provide additional support to the handguard. 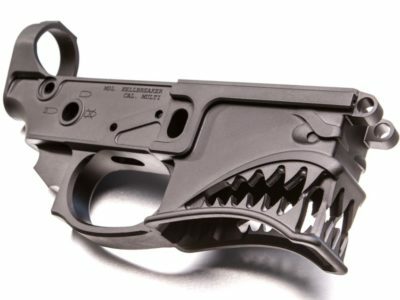 Even at their older price points, these unique and precision-made lowers have been a real success. It’s clear that Sharps is moving enough of their fun and functional receivers that they can lower their prices and expand their market. For a lot of people owning a Hellbreaker or the Jack would mean getting a dream gun – Sharps is making that dream come true a lot faster. Learn more at SharpBros.com. Gander Mountain Announces New Name, Cheaper Guns? No wonder we need more gun regulation. Paint them Orange and add another $1000 to the price. What a joke. They must thank money grows on trees. Just plain silly, unless you want a $1,000 wall hanger, you will get laughed off the range with your Mattel gun. Not bad a$$, bad idea, especially if you ever have to use it for real self defense, the prosecutor will have a field day. I just built a 6.8SPC using the old style Hell Breaker. Wishing I had waited for the new style now. The cut out relief on the teeth is bad a**! !